Get tickets now for LOVE, LOSS, AND WHAT I WORE! Tickets are now on sale online for LOVE, LOSS, AND WHAT I WORE, our fall production (October 18-21). A fun and funny show is always in fashion! 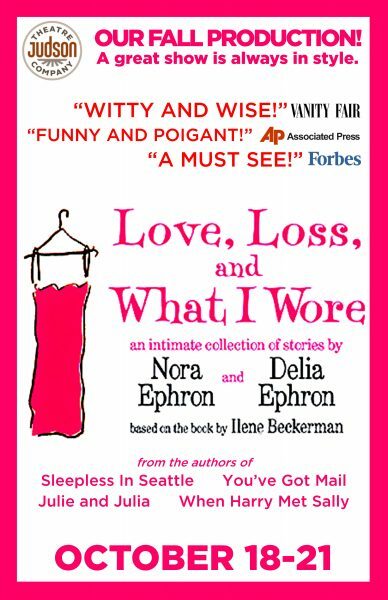 LOVE, LOSS, AND WHAT I WORE is a hilarious contemporary comedy from Nora Ephron & Delia Ephron the authors of SLEEPLESS IN SEATTLE, WHEN HARRY MET SALLY, YOU’VE GOT MAIL, and JULIE AND JULIA, based on the bestselling book by Ilene Beckerman. Five extraordinary women share an intimate collection of stories about how we mark the events in our lives via the clothes we wear. The cast includes Broadway, film, & TV favorite–and The Pilot columnist–JOYCE REEHLING (Law & Order). GROUP DISCOUNT: Save $8.00 per ticket when you buy a group of 10 or more adult tickets. Seating is GENERAL ADMISSION. NOTE: Due to the Owens Auditorium renovation, this production will be performed at the Hannah Center Theater at the O’Neal School. Though you can buy now online with no additional fees, tickets are not available at our local in-person outlets until Tuesday, September 4.